An ambitious ground worker has blazed an apprenticeship trail at one of the leading private companies in Hampshire, picking up a national accolade in the process. Trant Engineering’s Damian Nunn, a construction and specialist building apprentice, was named Outstanding Apprentice of the year in the annual National Construction College awards. The college is part of CITB, the Industry Training Board for the construction industry. Damian was chosen ahead of 2,432 apprentices across the country, including for helping others who struggled with coursework. He joined the multi-disciplinary contractor, which employs 1,100 people and is headquartered near Southampton, 25 months ago. “Trant Engineering has an inspirational commitment to workplace training and development – this kind of backing and support made me even more determined to repay their faith in taking a chance on me,” he said. Currently working on reservoir sites for a client, Southern Water, Damian passed with flying colours his Level 2 National Vocational Qualification (NVQ) Diploma in Groundwork and General Construction. Each NVQ level involves a range of on-the-job tasks and activities which are designed to test participants on their ability to do a job effectively, covering skills, knowledge and competence. As part of his apprenticeship Damian attended block release courses at CITB’s National Construction College at Bircham Newton, Norfolk, with a cohort of 30 apprentices. Now the 28-year-old operative from Fareham, who came from a motor mechanic background, has been placed by Trant Engineering on a Level 3 NVQ diploma in civil engineering as part of his career progression. Damian said: “The apprenticeship has transformed me – I had been pigeon-holed at secondary education as someone who wouldn’t do much with his life. Maggie Stefaniak, Training Coordinator for Trant Engineering’s Technical Development & Training Department, said: “Damian’s national apprenticeship award is thoroughly deserved. “He hides his light under a bushel – the fact is Damian went above and beyond the high bar we already set for our apprentices. “This was illustrated by Damian selflessly helping cohorts at the construction college who were struggling with some of the learning modules. “Apparently unprecedented, the class successfully completed their course ahead of the scheduled finish date. Damian’s input and dedication played a big part. 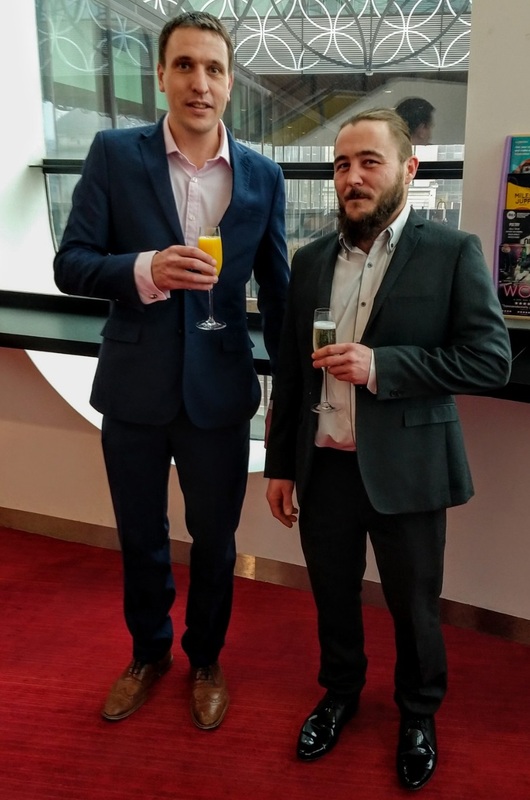 Accompanied by James Henderson, Director for Process and Water at Trant Engineering, Damian collected his award at CITB’s awards event at the Library of Birmingham. The award is the second of its kind for Trant Engineering in recent months – the firm was awarded plaudits by a leading education and skills college on the south coast of England. Trant Engineering has also been shortlisted in the Festival of Learning Awards 2019.